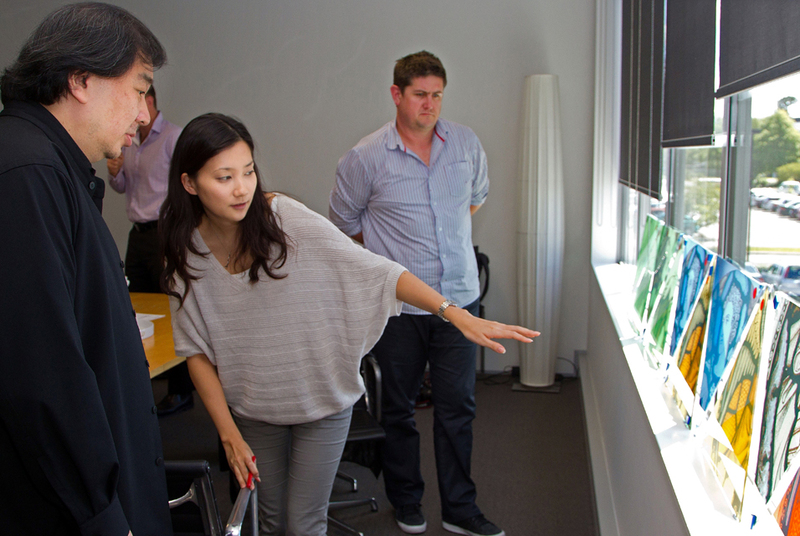 Architect Shigeru Ban (L) with his associate Yoshie Narimatsu (2nd L) looking at samples of stain glass windows for the new cardboard Christchurch Cathedral. When Japanese architect Shigeru Ban designed a new cathedral in earthquake-devastated Christchurch, he chose the most unlikely of materials -- cardboard -- for the landmark project. The New Zealand city's magnificent Gothic revival cathedral hewn from local basalt was irreparably damaged in the 6.3-magnitude earthquake that claimed 185 lives on February 22, 2011. AFP PHOTO / MARTY MELVILLE. WELLINGTON (AFP).- Sections of an innovative New Zealand cathedral being made from cardboard have gone soggy in the rain, but the project will still be completed next month, the Anglican Church said. The structure, which has walls made from cardboard tubes, is a temporary replacement for Christchurch's Anglican cathedral, which was destroyed in a February 2011 earthquake that killed 185 people in New Zealand's second largest city. Anglican Church spokesman Jayson Rhodes said recent rainstorms had left some sections of tubing wrinkly and sodden, meaning they would have to be cut out and replaced. But he said builders had always expected some problems with the unusual construction material and the damage was only cosmetic, leaving the structural integrity of the building intact. "Some of the cardboard got wet when the building was not fully enclosed... the roof is now enclosed and finished so that same risk doesn't exist," he told radio station Newstalk ZB. "It's nothing to be worried about at all. The builders anticipated this would happen. It's just cosmetic." He said the building, the brainchild of renowned Japanese architect Shigeru Ban, was "weeks away" from opening. The A-frame structure consists of 600-millimetre (24-inch) diameter cardboard tubes, coated with waterproof polyurethane and flame retardants, placed around a timber support structure and topped with a polycarbon roof. It is designed to hold 700 people and have building life of 50 years. Ban has forged a reputation as an "emergency architect" who uses readily available materials to quickly erect buildings in areas hit by disasters such as earthquakes. The Christchurch cathedral is the largest cardboard project he has attempted. Cleveland Museum of Art presents "Ai Weiwei: Circle of Animals/Zodiac Heads"